Stunning views of the Milky Way, shimmering aurora, spectacular thunderstorms, flashing meteors, zipping satellies, stirring music, and spooky sprites and gravity waves …. 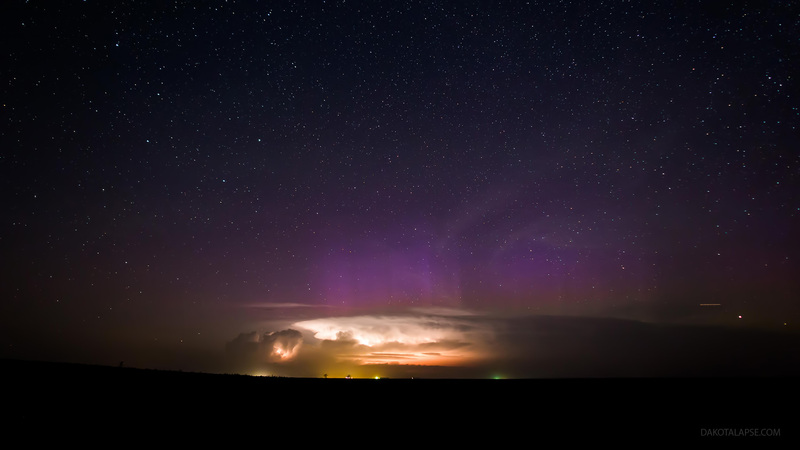 they are all part of this wonderful new timelapse by night-sky guru Randy Halverson. See more images and details at Randy’s website, dakotalapse. Remember at the end of “Star Trek: First Contact” when Lily looks up to see the Enterprise enter the temporal vortex with a flash of light? Astrophotographer Randy Halverson captured a view very similar to that scene, albeit without time travel or Vulcans standing nearby. Halverson did a quick search of launches during that time and found the Air Force had launched a semi-classified trio of satellites into orbit earlier in the evening of July 28th (23:28 UTC, 7:28 EDT) on a Delta IV rocket from Cape Canaveral Air Force Station, and further research indicated he had captured the engine burn of one of the satellite’s final boost stage. Just goes to show, you can never tell what you’ll see when you’re looking up! On board the Delta IV were two Geosynchronous Space Situational Awareness Program (GSSAP) spacecraft and the Autonomous Nanosatellite Guardian for Evaluating Local Space (ANGELS) NanoSatellite. Halverson conferred with a few NASA mission analysts and they all agreed the flash was coming from the ANGELS boost stage firing. “The first flash you see on the timelapse happened at 1:09am July 29th (camera time) so that also seems to match up with the timing for the final burn the article mentions,” Halverson said. Halverson said he used a Canon 5D Mark III with a Nikon 14-24 lens on an eMotimo TB3 mounted on a Dynamic Perception Stage Zero Dolly. See more of Randy’s great timelapse and night sky photography work at his website dakotalapse, or Twitter. We’ve oohed and ahhed many times over the handiwork of Randy Halverson and his Dakotalapse timelapse videos and imagery of the night sky. He may have outdone himself with his latest timelapse, called “Horizons.” Randy shot the footage from April – October 2012, mostly in South Dakota, but also some at Devils Tower in Wyoming. “Growing up in South Dakota the landscape itself can be beautiful at times,” Randy says, “but that doesn’t compare to what the sky can do, especially at night.” Not only is the imagery absolutely breathtaking, but the accompanying music is an original called “I Forever” by Bear McCreary (The Walking Dead, Defiance, Battlestar Galactica, etc) his brother Brendan McCreary and his band Young Beautiful in a Hurry. There’s a four-minute version below, but also available on Vimeo On Demand is a full 30-minute feature . Enjoy!! The lead image and this one below are recent images from Randy that he has posted on Flickr. Mirrored Aurora – Aurora mirrors off a small lake in central South Dakota on June 6, 2013. Credit and copyright: Randy Halverson/Dakotalapse.